Frequently asked questions and our answers are listet here. Your question is missing? Please contact us. Are microbiological air samplings generally a good idea when assessing mould spores in homes? We always recommend that you perform microbiological air sampling if indications show a microbiological risk, even when there is no visible risk of mould spores. Also, with medical issues or for the purpose of preservation of evidence, microbiological air sampling may be required. Moreover, we consider the use of microbiological air sampling, particularly particle collection, to verify clean-up operations as reasonable. There are cheaper air samplers than the LKS100 or LKS 30. Why is that? some models have “only” 100 jets, meaning that even low microbiological concentrations lead to considerable multiple occupancies at the germination places and hence reduced findings. some models have a significantly inferior filtration efficiency (cut-off) or its value is not specified (for good reasons?). The filtration efficiency indicates the smallest aerodynamic diameter of particles with a unit density, which are deposited with a probability of 50 %. The unit is “dae50”. The smaller the number, the higher the depositing performance. almost all other models “only” support airborne spore sampling. In addition to airborne spore sampling, our system also supports particle sampling and filtration. Using the MBASS30 and the transverse adapter for the air sampler, a 50 mm PU foam cylinder for chemical air sampling can also be loaded conveniently and battery-powered. on many models, no hose connection for sampling from cavities is possible. some models do not offer any volume flow control, meaning the preselected volume is only attained more or less by chance. some models are manufactured with poor quality. The components of our products are mostly made in Germany, with the exception of the electronic components and batteries. Our products are extremele durable and just as suited to outdoor operation at a building site as to a clean room in the pharmaceutical industry. For certain models, there is a need to purchase many additional components. We deliver our products in complete sets, software, cable, charger etc. are included in delivery. Many providers charge very high prices for their services and what was a supposedly good value device suddenly and unexpectedly becomes something very costly after the 3rd maintenance. If you take these points into consideration, you will agree that we offer very inexpensive and high quality products. Are there maximum values for microbiological loads in indoor areas? Which culture media should be used for airborne spore samplings? When the applicable scope of guidelines does not specify a particular culture medium to use for your examination, we recommend for the examination of mould spores, to do at least one sampling on both of malt extract agar (MEA) and dichlorane glycerine agar with chloramphenicol (DG18) at every sampling site. If the task of your examination involves the identification of thermotolerant or thermophilic mould spores, a second air sampling for later cultivation at 37 °C is advisable. How many liters of sample air are required for airborne spore samplings? The usual volume of sample air in the summer months ranges from 50 to 100 liters per sample. During the winter months, 200 liters per air sample are advisable. For air sampling of thermotolerant / thermophilic bacteria, up to 400 liters per air sample are indicated. If you expect a higher than normal bacterial count (e.g. areas with damage from moisture, areas around swimming pools), it is a very good idea to also take an additional sample of 50 liters. The laboratory can then evaluate the “more suitable” sample and avoid the problem of overloaded air samples, which can no longer be evaluated. If you anticipate a very high bacterial count (> 2000 KBE/m³), we recommend using the filtration method on a sterile gelatine filter with the FA 30 filter adapter or other devices. What role does the air temperature play when taking air samples? The sample air flows in concentrated form on the small areas underneath the jets in the air sampler. At lower air temperatures, these regions are partially subject to strong cooling. The viscosity of the culture media increases as the temperature drops. In the worst case, the surface becomes so hard due to the low temperature, that the particles of the air flow bounce off the surface and are carried away with the outgoing air. This leads to fewer particles getting deposited in this case. If air sampling has to be performed at a temperature below 10 °C, this effect should be taken into account during the evaluation. Why can the air sampling head LKS100 not be used with the separate MP2/39 pump although it fits mechanically? The air sampling head LKS100 is designed for a rated air flow of 100 l/min. The MP2/39 pump conveys, depending on the vacuum, a maximum of 39 l/min. Going below this rated volume flow causes the collection efficiency of an impactor to decline, which can lead to considerably reduced findings and hence faulty samples. The rated volume flow of the used sampling head must always be complied with! Why can I not load activated carbon tubes or TENAX tubes with the MBASS30? The air conveying device in MBASS30 is a high performance fan. Although unlike pumps, fans can generate higher flow rates, they cannot achieve a vacuum as low as pumps. The air resistance of activated carbon tubes is so high, that higher vacuums are required than is possible with a fans. However, the high performance fan installed in the MBASS30 is capable of loading close meshed 80 mm circular gelatine filters. 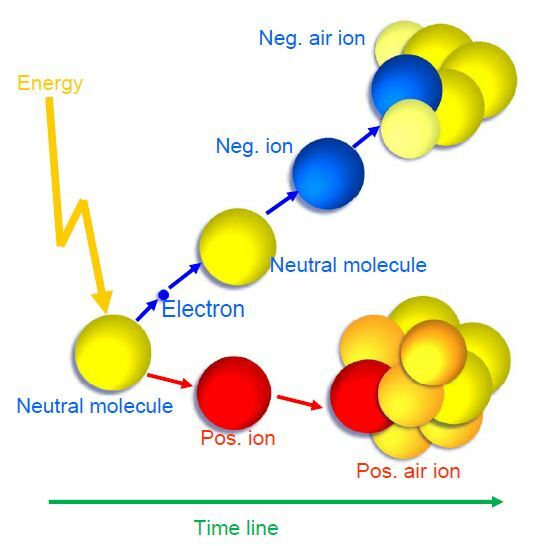 Air ions are molecules or particles in which the number of negatively charged electrons and positively charged protons is unequal due to the release or absorption of electrons. The formation process of air ions is illustrated in the adjacent graphic. Is it true that the natural air ion concentration has continually declined in the last 12 years? We have also observed a reduction of the natural air ion concentration in recent years. Whereas in 1998, concentrations of 500 to 900 ions/cm³ were still measured, in recent years the value has fallen to 250 to 500 ions/cm³ in the outside air. With the ionometers by Umweltanalytik Holbach GmbH, a cable for discharging static electricity from the housing is included. Should this cable always be connected? This discharging cable should be used at all times when the ionometer is operated with connected charger / power supply. The switching power supplies / chargers have an effective capacitive coupling to the mains. Without the discharge, a high-resistance voltmeter would be capable of measuring alternating voltages of up to 90 volts from the housing to earth. The resulting fields have an influence on the air ions in the vicinity of the device and may influence the measurement. For measurements carried out on battery-power, care should be taken to ensure that possible electrostatic fields, which may occur during handling (carrying, depositing etc.) of the housing, are discharged before the measurement is performed. Does humidity affect the concentration of air ions? Yes, humidity affects the concentration of air ions. However, our ionometers measure the actual ion concentration which reaches the electrodes, meaning this influence is not taken into account. When using the optional extension tube, should a reduction in the measured values be expected? Yes, during the time the air ions stay within the extension tube, recombination processes occur as a matter of course, which lead to a reduction in the air ion concentration.